React Form: A Framework for Form Building in React Apps — At just 4KB minified, it supports dynamic fields, validations, building your own input types, nested forms, and more. Testing React Components with Jest and Enzyme — Shallow rendering, snapshot testing and many examples. How to Create Dynamic JSX Tags — A very brief look at using content and tag names contained in variables rather than all being hard-coded. React+D3v4 pre-order — React with d3v4 is the best way to turn data into knowledge. Learn how to build declarative dataviz components, add animations, user interaction, and high performance canvas stuff. Book out Dec 25th, special pre-order price now. What Were The Biggest 'Aha!' Moments You Had Learning React? 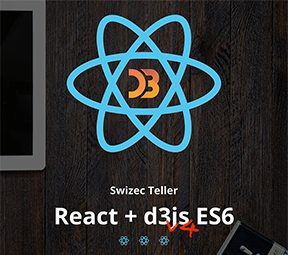 Five Reasons Why Web Developers Love React Native — Robert Sekulić examines why React Native is shaping up as a great option for modern app dev. How to Debug Component Performance with ES7 Annotations — Using a custom ES7 decorator to find reasons for rendering performance issues. Webpack and CORS: Demystifying Cross-Server Communications in React — A look at a use case of Webpack involving an app consisting of a React frontend communicating with an Express.js REST API. Carbon UI: Universal Material Design Components for React Native — A write-once, run-anywhere Material Design library. GitHub repo.